Rest of system: ￼Wilson Audio Maxx3 speakers (pair), NeoDio NR22T transport ($12,700) + NR22D DAC ($12,000) OR, NeoDio NR32D “Origine”, Kronos turntable, ZYX UNIverse II cartridge, Graham Phantom II Supreme 12-inch tonearm, Critical Mass Systems MAXXUM precision component support system per component, MAXXUM precision amplifier stands. Lamm L2 Reference line-level preamplifier (preamp and power supply). Rest of system: Verity Audio Lohengrin II S speakers, TechDAS AirForce One turntable, Nordost licensed cables, Graham ZYX UNIverse II cartridge, Omega cartridge, Tech DAS Phantom Elite tonearm. One of the last rooms on my jaunts through the Venetian was to hear the Lamm/Verity pairing. The LammML2.2 monos ($37k/pair) are regarded as, perhaps, one of the finest sounding SET amps on the market today — and yes, there are two (hotter-than-hell) 63CC-B tubes in there, one of which is the voltage regulator. As to the best-of-the-best claim, I can’t even speculate, but I am curious and 18wpc is a very interesting number to hit in a tube amp. Insert drool here.The story here at CES was the big Verity Lohengrin IIS loudspeakers ($110,000/pair). A brand new crossover and a new integrated plinth that acts as an acoustic isolator and bass resonator. Two pairs of the Lamm ML2.2s were used to biamp these great big monsters.Sound here was challenging in much the way it was for the other mega speakers in the bass-devouring Venetian Hotel (why do they show here, again? ), but the “everything else” coming through was pretty, elegant, detailed and everything an audiophile could want. Love to hear these in a venue that would allow them to really sing.Shown here with the Air Force One turntable (~$70k). AV Showrooms has a good, long look at the table, so I’ll simply reference it here (see below). This was the second room I found one in (the other one being the sweet-sounding Genesis Audio room), so I know there are at least two of these in existence. I’m a bit non-plussed by the aesthetic on this ‘table, but it does have some fancy features like an air bearing and a vacuum hold-down. Given the enthusiasm the reviewers I’ve talked to have for the it, I suspect we’ll be seeing a lot more of these at future shows. The changes to Verity Audio’s Lohengrin IIS speakers ($100,000 per pair) are both internal and external. Inside, the speakers have a completely redesigned crossover, this becoming necessary because of the external change. If you look closely, you’ll see that the speakers now rest on short platforms. Citing that the energy transferred to the floor from a large speaker like the Lohengrin, Verity Audio designed a platform that makes this energy more consistent from surface to surface. It acts as both a resonator for the bass cabinet and an acoustic isolator for the entire speaker. Julien Pelchat and Bruno Bouchard of Verity Audio told us that they also studied available drivers in search of new ones that fit their design criteria better, but they found that the ones already used in the Lohengrin II were still the best. Earlier versions of the speakers can be upgraded, something a change in drivers most likely would have prevented. What about the sound of the Lohengrin IIS? Driven by two pairs of Lamm ML2.2 monoblocks, there was liquidity, authority, coherence, and fine detail all in equal measure. The Lohengrin IIS and ML2.2 seems to be one of those hand-in-glove combinations. Lamm Industries is as another exhibitor that always manages to impress in new ways every year. The smaller (though still bigger than most) of Lamm’s two rooms featured Lamm’s LP2 Deluxe phono stage ($7790), L2 Reference line stage ($15,970) and two pairs of ML2.2 amplifiers ($37,290/pair) at work between a turntable as fascinating as last year’s Kronos, the Tech DAS Air Force ($79,500), and the new Verity Audio Lohengrin II S speakers ($120,000/pair). A Mark Levinson No.31.5 transport fed a Tech DAS D-7i DAC ($7600) on the digital side of things. The Tech DAS ‘table is about as exotic and complex a piece of engineering as can be imagined. Designed by veterans of turntable legend Micro-Seiki, it features an air-bearing platter, vacuum LP hold-down, an air/liquid suspension system and other leading-edge technologies. As shown, the Air Force was equipped with two ‘arms, with a 12″ Graham Phantom Elite ($8500) and a Zyx Universe II cartridge ($8495) at the plate when I was in the room. The new Lohengrin was, to my ears, more solidly integrated from top to bottom than the earlier model shown last year, with a substantially more coherent blend between the rear-facing woofer module and the forward-firing mid/tweeter cabinet. This year the larger of the two rooms featured Lamm’s new LP1 Signature three-chassis phono stage ($32,790), which comprises a pair of power supply units and a third box that handles connections and switching. The new LP1 was joined by Lamm’s LL1 Signature dual-mono — quite literally, as it is contained in four chassis — line stage ($42,790) and always-extraordinary ML3 Signature amplifiers ($139,490/pair). All of this exotica spoke through Wilson Audio Specialties MAXX 3 speakers ($69,500/pair), rested upon Critical Mass Systems MAXXUM racking ($67,800) and amp stands ($22,600 for the four needed for the ML3s), and all tied together with Kubala-Sosna Elation-series signal cabling and power cords ($88,400 total). Sources were two of the most impressive pieces of kit I have heard. The Kronos turntable ($32,000) carried a Graham Phantom II Supreme 12″ ‘arm ($6000) and a Zyx Universe II cartridge. Kronos’s Louis Desjardins has been singing the praises of the Universe II to anyone who will listen for the last several months, and his high opinion of the cartridge is more than justified. It combined the sort of lusciously developed midrange timbres one associates with cartridges like the top-end Koetsus with a bewitching ability to reveal the finest lowest-level details on even familiar recordings like Duke Ellington’s Indigos (a reissue from Jazz Track Records, and an LP I know like the back of my own hand). Paul Gonsalves’ breathy, luscious tenor sax on “Where or When” was enough to make the steeliest audiophile swoon. In ordinary circumstances it would be nearly unfair to compare this stellar analog front-end to any digital playback equipment, but this was no ordinary room. Digital gear from France’s Neodio has been prominently featured in Lamm’s rooms for the last several years and has been consistently impressive. This year, Neodio’s president and chief designer, Stephane Even, was present for the debut of the new Origine “digital audio source” ($27,000), which can either function as a conventional CD player or accept virtually any input for use as a standalone DAC. It takes a certain amount of confidence or foolhardiness to bring a one-box digital source to a system like this, but I can say with confidence that the Origine is something very special and that Even’s confidence was fully justified. It had a completely natural sweetness that immediately disarmed me and made me forget that it was a digital source. Candice Night’s voice was absolutely enchanting on “Under a Violet Moon.” Now that Neodio is being distributed in North America by Precision Audio/Video, which also handles Venture electronics and speakers, it should start getting some of the attention that these remarkable components merit. Stephane has already told me that an Origine will be coming my way in the near future. Vladimir Lamm updates his products infrequently and releases new products deliberately. He completed the design work for his LP1 Signature phono stage ($32,790) years ago, but only now is it a commercial reality, perhaps because of its ambitious arrangement. 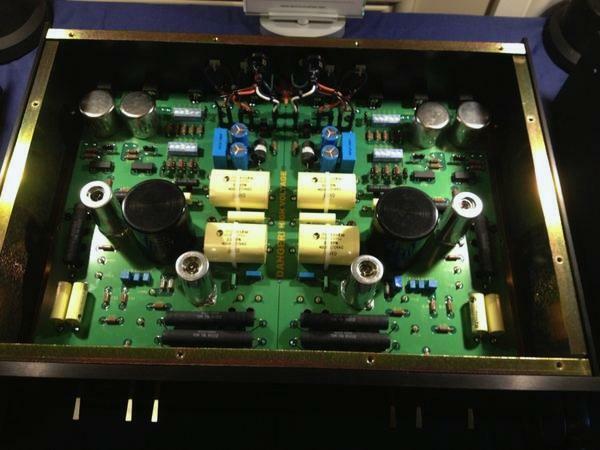 Its three chassis comprise a pair of tube-rectified power supplies — one for each channel — feeding a dual-mono phono stage. The mirrored dual-mono layout of the LP1 Signature is easy to see. There are three inputs: two for moving-coil cartridges and one for moving-magnet. The two moving-coil inputs are slightly different: one is meant for very low-output cartridges, providing 71dB of gain along with a low 30-ohm input impedance, and the other uses the same step-up transformer as Lamm’s LP2 Deluxe phono stage and provides 59.7dB of gain. Unlike Lamm’s LP2 Deluxe phono stage, loading and capacitance with the LP1 Signature are adjustable in five steps via banks of internal switches. Vladimir Lamm reprised his room from last year spotlighting how his low-powered SET amplification could drive the Wilson Audio Maxx3 loudspeakers to thoroughly realistic sound levels. The Lamm complement included the LL1 Signature line level preamplifier (($42,790) and ML3 Signature monobloccks ($139,490/pair). Also introduced was the French company Neodio’s new Origine CD player ($27,000). In the next room, Vladimir again bi-amped a pair of Verity Lohengrin IIS loudspeakers ($120,000) with two pairs of ML2.2 monoblocks ($37,290/pair). The front end was an L2 Reference preamplifier ($15,790). There was quite a bit of interest in the new TechDAS AirForce One turntable ($79,500) outfitted with a Graham Phantom Elite 12-inch tonearm ($8500) and ZYX Omega cartridge ($4995). The Lamm LP2 phono preamplifier was used. TechDAS also showed off its digital prowess with its D-7i 192/24 DAC ($7600). Anche in questa edizione LAMM aveva allestito due sale di alto livello, presentando il nuovo pre phono LP-1 Signature a due telai. La catena comprendeva inoltre i finali ML-3, il pre LL-1 e una coppia di Wilson Audio MAXX3. Notevole anche il giradischi Kronos equipaggiato con braccio Graham Phantom II Supreme e testina ZYX Universal II. Nell’altra sala c’erano i finali ML2.2 a pilotare una coppia di Verity Audio Lohengrin. Se si decidessero a dare un po’ di volume con qualche buona incisione sinfonica moderna un sistema del genere farebbe un effetto ancora più coinvolgente. Lamm Industries introduced the new LP-1 Signature dual-mono phono preamplifier ($32,790), with two separate chassis power supplies. Each channel uses two high-transconductance triodes without feedback. The new phono preamplifier was used in a system with Lamm ML-3 amplifers ($159,490), an LL-1 preamplifier ($42,790), connected to a pair of Wilson Audio MAXX3 speakers ($69,500/pair) with Kubala-Sosna cables throughout. Music was played on a Kronos turntable ($32,000) fitted with a Graham Phantom II Supreme tonearm ($6000) and a ZYX Universal II cartridge ($8,495). Vladimir Lamm was also using two pairs of his ML2.2 monoblocks ($37,290/pair) to drive a pair of Verity Audio Lohengrin loudspeakers ($120,000/pair) in an adjoining room. The sound in both rooms was spacious, smooth, dynamic, and full. Lamm Audio celebrated its 20th anniversary with the world premier of the LP1 Signature phono preamplifier ($32,790). It’s a monumental three chassis affair with two external power supplies – one per channel. Most of the complexity is in the power supplies which feature toroidal power transformers, tube rectification, and extensive voltage regulation. There are a total of three inputs, one MM and two MC with adjustable cartridge loadings. Designer Vladimir Lamm explained that in order to keep the signal path as simple as possible he opted for passive RIAA equalization to maintain the number of active gains stages at two. Both stages are single-ended Class A using Russian 6C3P (first stage) and 6C45P-E (second stage) triodes. No global feedback is used. The LP1 is engineered with excellent headroom reserve and current drive capability to accommodate long cable runs. Naturally, it’s a labor of love – only the best, and consequently very expensive components are deployed. Vladimir is particularly proud of this design and believes that it will hold up as a reference for the next 100 years! One of the most ambitious and costly phono stage preamplifiers to be seen at CES was the three-chassis Lamm LP-1 Signature, which features not one but two outboard dual monaural LP1-PS power supplies. Lamm’s new flagship phono stage completes their Signature series of products, joining the ML3 Signature mono power amplifiers and LL1 Signature preamplifier. The new LP1 Signature is priced at $32,790 and features . . .
. . . dual-mono power supplies that come in separate boxes, making the LP1 a three-chassis affair. Impressive. Vladimir Lamm took me through his new 3 box LP 1 Signature phono preamplifier. Each channel has its own power supply. The all-tube design uses transformers for the first MC stage. There are three inputs: two MC, one MM. The two MC inputs have different turns ratios to accommodate both ultra-low and medium low output MC cartridges. Price is (gulp!) $37,790. You can be sure the highest quality components are used throughout. It was ultra-quiet and sounded superb playing back a track from “Mel Torme Live at Marty’s”. When I asked Mr. Lamm if the signature referred to the fact that to own one you have to sign your life away, he did not laugh. Actually I did not make that joke with him. Just you.